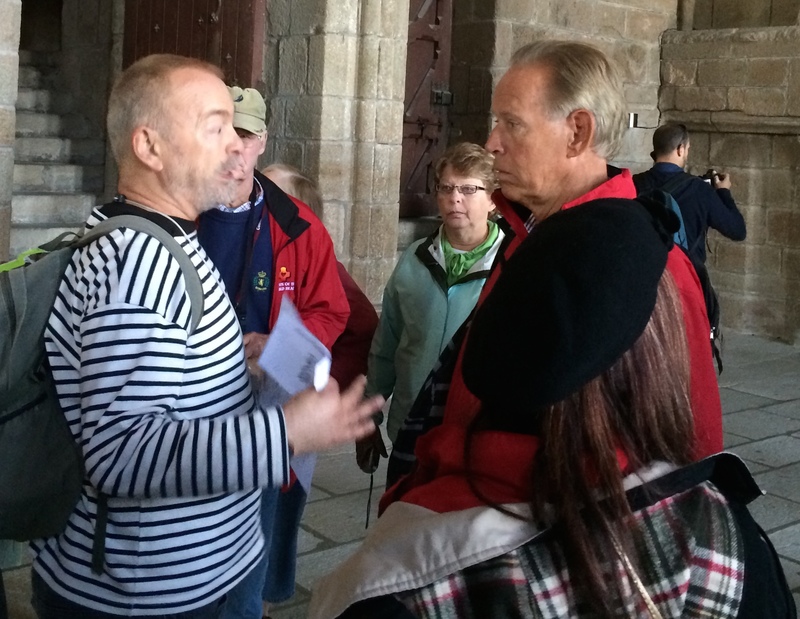 A pilgrimage to France | Walk with us! Wednesday, October 1: Left St. Louis in the morning for JFK airport in New York. The heavens were as blue as the legendary robe of Mary, and I was on my way to Lourdes. Good flight. Lots of time in the airport to meet most of the others in our group of 30, including Fr. Dominic and Pam, before our 8:00 p.m. Delta flight to Schipol Airport in Amsterdam. Thursday, October 2: Tough flight; didn’t sleep. We transferred to a KLM flight to Toulouse, France. Nice plane and lovely flight attendants. Two people had lost luggage, so there was a big run-around in French and English in Toulouse. We took off in a pullman bus but had to return for the lost items. Although everyone was exhausted, it was a beautiful two-hour ride through the French countryside. We arrived in Lourdes at 5:30 p.m., 12:30 St. Louis time. There were many quaint, one-car-wide streets, and it was very hilly in the Pyrenees. Almost every shop was piled high with religious items. We found our Hotel Chapelle et Parc, a small place of faded glory. There were thousands of Italians about and many women dressed all in white like nun-nurses; they were actually lay women who were volunteers to help the ill. I had a good hotel dinner with five ladies, three from Long Island. Afterward I walked to the Our Lady of Lourdes Grotto and there were thousands processing in the night with candles, singing and praying the rosary in six languages, hundreds in wheelchairs or little carriages, old and young, parents with their children, young spouses wheeling a disabled partner, children with elderly parents. It was a parade of human suffering which was heart-breaking and brought me to tears. Then a choir sang the Lourdes song and the Ave Maria, with a soprano soaring above it all; really moving. Although I had not expected to like Lourdes, the amount of faith and hope, and love and care for the ill, was truly inspiring. At the end of the day I fell into bed. Friday, October 3: What a packed day! After a short night we had breakfast and we were off to the Grotto, just around the corner, for a 9 a.m. Eucharist with our group. Fr. Dominic and I were joined by a Father Festus and his group from Nigeria, Father George, I believe, and a group from Australia, and Fr. Jerry Drummond with his mother and a whole group that could not fly who came from England in a “jumbulance,” a bus with medical equipment and staff. 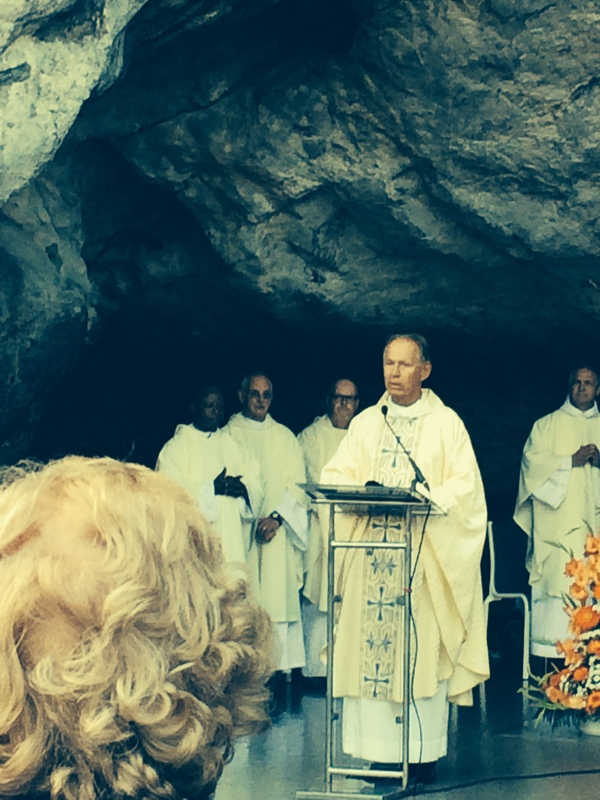 I was chosen by the three others to have the honor of presiding in the Grotto cave. I was going to preach but suggested that Fr. Jerry do so because he is a regular. It was a wonderful experience. Then we did a walking tour, first of a new, massive underground church for pilgrims, then of Bernadette Soubirous’s home in a mill, then of a home her father owned before becoming unemployed because of an accident. The home is still in the family. We walked across town to Sacred Heart Parish where she was baptized. Then seven of us had lunch outside at a cafe, the Leffe, while others went back for the baths at 1:00 p.m.
We toured the Cachot, the former prison the Soubirous family lived in when they were very poor. It was from there that Bernadette entered the convent in Nanterre; she died there. Fr. Dom, Pam and I went to the Keep, an old fortress overlooking the town, and toured a fascinating museum on the culture of the Pyrenees. 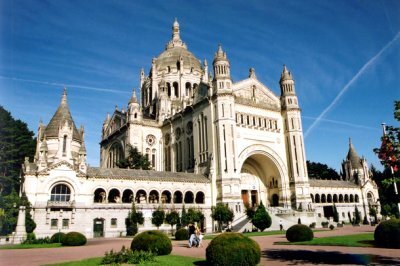 We all gathered again at the hotel and I went to see the lower church of Our Lady of the Rosary, then the crypt of the Basilica and the relics of Bernadette, and finally the top Basilica of the Immaculate Conception. Finally I visited the spring again, bought some candles and got some water for sick family and friends. We had dinner at the hotel again and I went back early to join in the candle procession and rosary. I ran into some of the Nigerians and Fr. Festus who were delighted to see me, and also a group from Philadelphia with their two priests. Being part of the procession was not as impressive because I could not experience the full extent of the suffering and hope as I did when observing the whole procession. Saturday, October 4: Another short night with a 3:30 a.m. wake-up and breakfast at 4:30. We had to make a 6:30 TGV (French speed train) to Paris and were in a near panic trying to get all the bags on before the train left. It was very quiet and there was no sunrise till 7:45. The countryside was like an impressionist painting in the fog and mist. In six hours we reached Paris, Montparnasse station, and had another panic unloading and guarding all the bags. We had a very long walk to the bus, and back for the restrooms. We headed by bus to the Peripherique (beltway), and off to Cabourg, two-and-a half hours north. During the ride I gave a short biography of Father Dehon, our Founder, and explained our spirituality of oblation and reparation, and the daily prayers for each that we included in their travel booklet. Because of travel we did the liturgy of the word of St. Francis of Assisi on the bus. Our beautiful Hotel Mercure was on a lush racetrack. We had a gourmet dinner of salmon in a light tomato cream sauce, wild rice, and a berry charlotte dessert. Everyone was in very good spirits after another full day of travel. Sunday, October 5: I had a good sleep for the first time and the morning offered a 6:30 a.m. American breakfast with eggs and bacon/sausage. 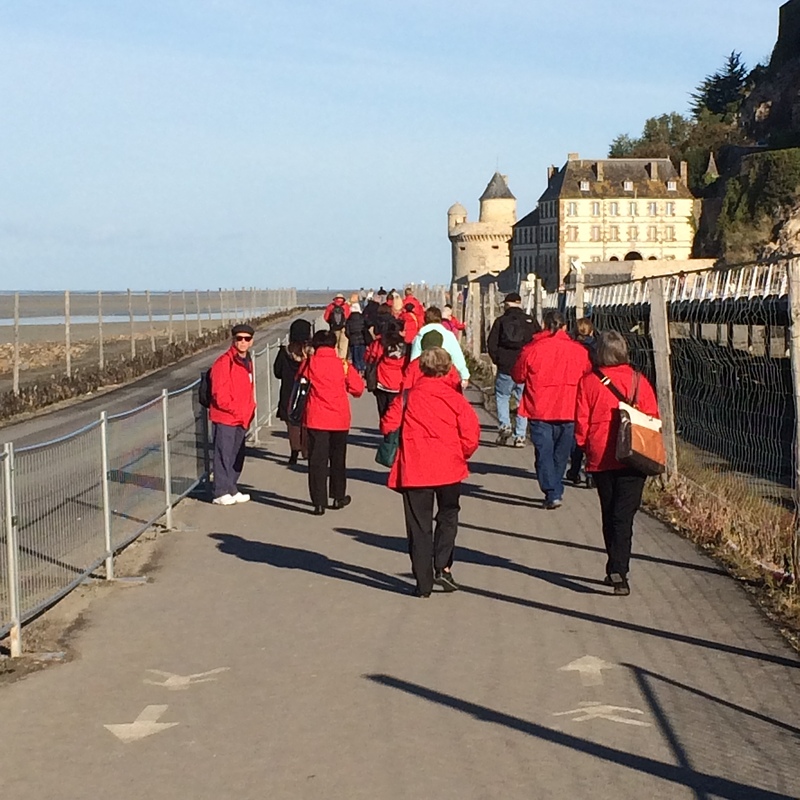 We left for a 92-mile, over two hour, bus ride to Mont St. Michel, which was visible from miles out. It was a beautiful, sunny day. There is new parking far from the island, with shuttles to the new bridge. The former causeway will be removed soon because it blocks the tides and was reconnecting the island to the mainland. It was an incredible climb up the mountain on a very narrow pedestrian street chocked with shops, restaurants, and hotels. About half way up, at the little parish church of St. Pierre, many stopped and waited till we returned for Eucharist there. We had a nice tour of the fortress/ former Benedictine monastery which now houses a small group from the Jerusalem Community that was founded in Paris; the community serves the parish of St. Gervais there. I got to chat with one of the young nuns. We toured the church, refectory, scriptorium, chapel of St. Margaret Mary, and the cloister. At St. Pierre we met the pastor who is 95 years old and who was there 30 years ago during my last visit. Fr. Dominic presided at Eucharist, and a group of Spanish-speaking people joined us. After, Fr. Dom and I caught a sandwich and drink on the way down. 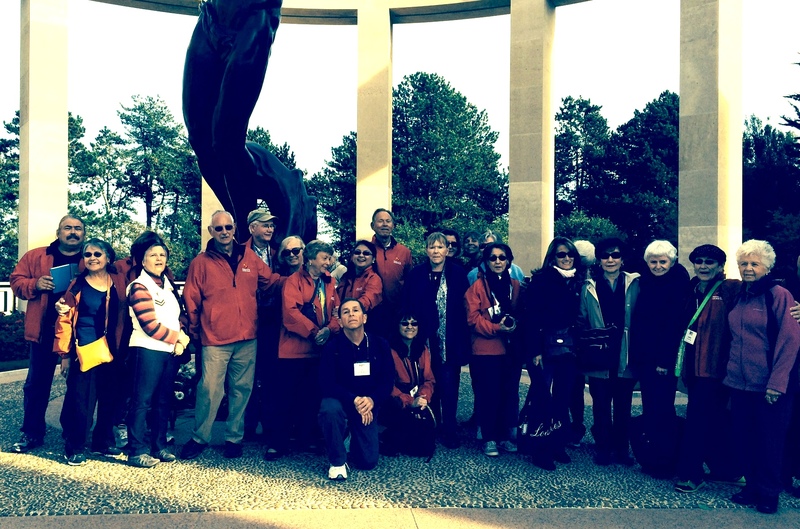 We had a two-hour trip to the Omaha Beach Cemetery and a brief visit. Our French guide reminded us that we were entering American territory. Under a clear blue sky, overlooking the sea, set in lush green grass were thousands of stark white crosses and a few stars of David marking our dead young Americans. It was literally breathtaking. We took a group picture in front of the memorial, and behind it were walls with all the names of the deceased. Then we went to Omaha beach to gather sand, and there stood a touching monument of a young soldier charging through the surf, dragging his dead buddy behind him. Needless to say, we left in a very somber, sober mood. After a time of reflection we prayed for all the deceased and then said Pope Francis’s prayer for peace that there be war never again. We got back late for another wonderful dinner of shrimp with avocado salad, pork leg with potatoes, and dessert. Monday, October 6: Another early morning with breakfast at 6:30 a.m. and departure at 8:00 for Lisieux. In only 45 minutes we arrived at Les Buissonets (the Little Bushes), the family home of Therese Martin, the Little Flower of Lisieux. It was a large, affluent home. It was so early that we could not enter and only got photos. Because Therese’s mother died when she was only four and her elder sister, who became her second Mom, left her for the convent, Therese was, with a dispensation, permitted to enter the Carmelite convent (the “Carmel”), in 1887 at age 15. We visited the Carmel, the church, museum, and her tomb. Then we went to the Basilica of Ste. Therese. It is a massive church with a fine visitor center where there are informative posters and pictures about her life. We had Eucharist in the crypt adoration chapel and Fr. Dominic presided, while I preached and cantored. Then we traveled an hour-and-fifteen minutes to Rouen. It was pouring so we rushed to cafes with only an hour for lunch. I translated for a group of eight at Cafe Paul, across from the south transept. We toured the Cathedral and then we tromped through the pouring rain to the site where Joan of Arc was burned at the stake. It is now a large circle of varied flowers with a tall, pointed monument topped with a cross. We had a very long ride to Paris and arrived just in time for their daunting rush-hour traffic. However, in the midst of the terrible traffic we had beautiful views of the Bois de Boulogne (huge park) and the Champs Elysees. When we got to the TimHotel it was raining, we could not park on the narrow street, and the elevator and keys were not working. The hotel was booked solid so we could only solve problems by switching around rooms. After we were more or less settled we walked up to the Bistro Montmartre, a little family place near the Moulin Rouge and had a dinner of rice and veal stew with mushrooms and carrots and a dessert of ice cream and chocolate sauce. Everyone was feeling better afterward, although some were still sorting out rooms at 10 p.m.
Tuesday, October 7: After a frustrating evening of bags and rooms, everyone was settled and we had a very good breakfast. We took a long bus tour through Paris to the Trocadero for views of the Eiffel Tower. It was a beautiful, crisp morning. Then another long ride to the Parish of St. Sulpice, where Father Leo Dehon, our founder, was a regular member when in college and law school. It was there that he joined the St. Vincent de Paul Society and was first touched by direct service to the poor, and I believe converted to a new mind about the deprived in society. We went to Sainte Chapelle and had a good visit; the light was good for the extravagant stained-glass windows. This was built by King St. Louis IX for the relic of the crown of thorns. Then we walked over for a tour of the Cathedral of Notre Dame. There was a Eucharist being celebrated but I was able to get some beautiful photos of the Notre Dame statue, rose windows, a high-relief carving of Thomas with the risen Jesus, and Joan of Arc. It is amazing that in the midst of hundreds of tourists, real prayer occurs, and it is obvious why all of the older churches keep the Eucharist reserved in a side chapel for more quiet prayer. Four of us had lunch at Cafe Esmeralda across from the Cloister Garden at the east end of the Cathedral. Then we had a long drive through the city to the north and the Basilica of Sacre Coeur (Sacred Heart). We first visited St. Pierre, the little parish church of Montmartre, where St. Ignatius Loyola and his companions took their first vows. A new community of nuns at Sacred Coeur care for things, and a sister had me go before the exposed Eucharist at the main altar and pray the Litany of the Sacred Heart and a prayer of consecration to presence before the church full of pilgrims and tourists. Then our group proceeded to the crypt for Eucharist, and I presided and preached. Afterward we moved up our dinner from 8 p.m. to 6:30 and we had a really enjoyable time at the Cafe Cremaillere on the Place du Tertre (square of the artists) by Sacre Coeur. The restaurant was narrow but went deep and we had the section to ourselves with recorded music by Charles Aznavour, the French parallel of Frank Sinatra. We had classic French dishes: onion soup, boeuf bourguignon, and a crème brule that was excellent. Then it was a long walk back to our hotel; it got a little scary when we passed a man on drugs who was combative. But, we passed without incident. Wednesday, October 8: A large group had come to our hotel, filled the dining area, and eaten like locusts. Our pickings were slim when we got there. Once again it was raining and we had a delay. Because of the delay we were left standing in the rain at Versailles for over a half hour since we lost our reservation slot. The Palace of Versailles was mobbed with tourists and it was hard to stay together and hear our guide. Many things have been refurbished there and it is stunning, although the tour was shorter than the one I took years ago. It was raining too much to tour the gardens so we took off for Chartres. The Cathedral of Notre Dame is noted for its stained-glass windows. Also the apse and choir have been cleaned and are gleaming. They are working on two other sections. We had Eucharist in the crypt and Fr. Dominic presided and preached. Again, we had a very pleasant sacristan. We had an easy trip back to our hotel and moved dinner up to 8:15 p.m., again at the Cafe Montmartre. There was a group of 50 Filipinos from Kuwait there with their own pianist and they were loudly singing show tunes and even Christmas carols in English. It was fun. We had another good dinner of terrine de campagne and then sole with herbs and potatoes, with a dessert of charlotte with berries. Thursday, October 9: We were able to rise later today. The big group was leaving so we had space and food this morning. We went to the shrine of St. Vincent de Paul, a classic church, obviously an active parish. His relics were below a crucifixion sculpture. Our group had more time to pray. Then we went to the shrine of the Miraculous Medal, the motherhouse of the Daughters of Charity, with over 100 sisters. The chapel was beautiful and the group experienced the Eucharist as a highlight. We celebrated a Mass of Mary and I got to preside and preach on the Gospel of Gabriel’s visit to Mary and her Ecce Ancilla (Behold the Handmaid of the Lord) and Jesus’ Ecce Venio (Here I come to do your will, O God), a text beloved by Father Dehon. I had taught our group the hymn Salve Regina on the bus and when they sang it with a church full of people it was very moving. There was no rain and after Mass the sun came out and we had a free afternoon. A group of us walked toward the Seine and had lunch at a corner cafe on rue Ste. Germaine. 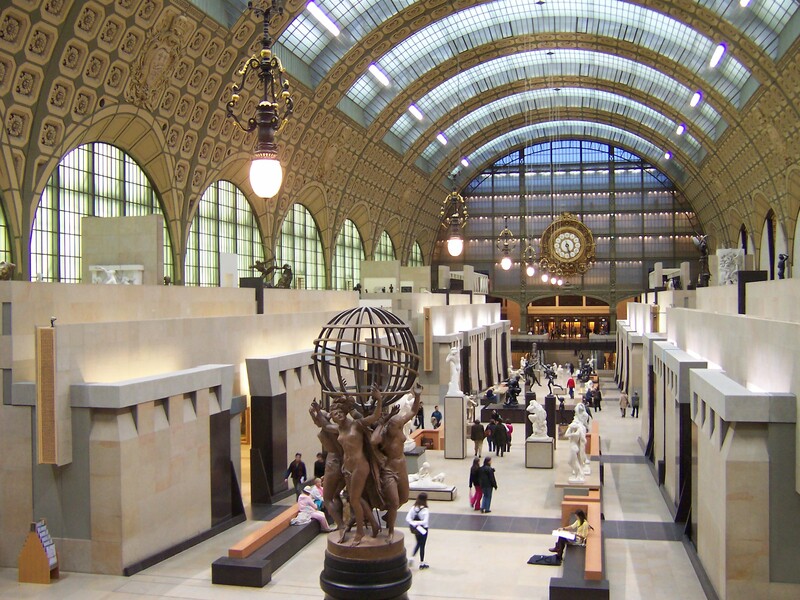 Then we walked to the Musee d’Orsay (the Orsay Museum) and we had a little over two hours free. I got to see some of my favorite impressionists, such as Renoir, Monet, Manet, Toulouse-Lautrec, as well as van Goghs. For the first time this trip I took the Metro back to change for dinner. All dressed in their best clothes and we left early for the Eiffel Tower. We had a slight wait for the group ticket up the elevator in the northeast leg to the first level. There are spots with new glass floors that give interesting views of those on the ground. We had dinner at 58 Tour Eiffel, an Alain Ducasse restaurant. Others had large prawns in avocado and I had duck pate. Then we had leg of lamb cut like filet mignons, with potato galettes and an herbed, foamy cloud of egg whites, with Bordeaux wine to drink. For dessert we had meringue shells with whipped cream and caramel bits in a caramel sauce. Perhaps my best meal ever. Afterward we did a tour of Paris at night on a navette, a river boat. Gorgeous. Friday, October 11: We got to sleep in and have a leisurely breakfast. I helped one woman shop for pastries. We left early for Charles de Gaulle Airport, and it was a good thing because nine of us had our tickets cancelled, and it took forever to get re-ticketed and check in. There is a beautiful new international terminal for Air France. We had a 777 and a good flight, although I had an inside seat. I watched the Grand Budapest Hotel and Nebraska. I was seated between a young woman who is an international lawyer from Beijing and a man from Denmark on his way to visit a brother in America. We arrived on time and experienced a new immigration process of checking oneself in before meeting an agent. Customs was easy. I still am automatically saying “Merci” to people. It will take time for all of me to be home. It was a blessed trip and I met a lot of wonderful people. The benefits and blessings far outweighed the rain and scheduling and hotel problems. I am grateful to Fr. Dominic and Pam for all they did to arrange this and manage it.